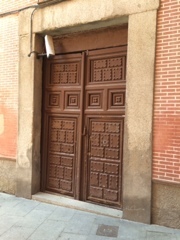 Years ago I had been to one of the convents in Madrid hoping to buy their pastries but alas, they were closed. It wasn't until recently that I finally had the chance to try one of their delectable cookies. The Monastery of Corpus Christi is on Calle del Codo which is off the popular Plaza del Conde de Miranda. Buzz the nuns at the door to let you in. The second buzzer is for the monks which you can ring if you wish to go to confession. Once you're inside you pass a courtyard to a short corridor before you enter an open door where you can ask the nun in attendance what you'd like from the list posted on the wall. It is possible they may only have one pastry available (as on the day I went). If they have different items available, they will put the boxes of pastries or cookies on the lazy susan and you can put your money on top of the box you wish to purchase. Your change and box of sweets will come around shortly.